A set of dice is nontransitive if it contains three dice, A, B, and C, with the property that A rolls higher than B more than half the time, and B rolls higher than C more than half the time, but it is not true that A rolls higher than C more than half the time. In other words, a set of dice is nontransitive if the binary relation - X rolls a higher number than Y more than half the time - on its elements is not transitive. It is possible to find sets of dice with the even stronger property that, for each die in the set, there is another die that rolls a higher number than it more than half the time. Using such a set of dice, one can invent games which are biased in ways that people unused to nontransitive dice might not expect (see Example). An example of nontransitive dice (opposite sides have the same value as those shown). Consider the following set of dice. Die A has sides 2, 2, 4, 4, 9, 9. Die B has sides 1, 1, 6, 6, 8, 8. Die C has sides 3, 3, 5, 5, 7, 7. The probability that A rolls a higher number than B, the probability that B rolls higher than C, and the probability that C rolls higher than A are all 5/9, so this set of dice is nontransitive. In fact, it has the even stronger property that, for each die in the set, there is another die that rolls a higher number than it more than half the time. Now, consider the following game, which is played with a set of dice. The first player chooses a die from the set. The second player chooses one of the remaining dice. Both players roll their dice; the player who rolls the higher number wins. If this game is played with a transitive set of dice, it is either fair or biased in favor of the first player, because the first player can always find a die that will not be beaten by any other die more than half the time. If it is played with the set of dice described above, however, the game is biased in favor of the second player, because the second player can always find a die that will beat the first player's die with probability 5/9. win against each other with equal probability they are not equivalent. While the first set of dice (A, B, C) has a 'highest' die the second set of dice has a 'lowest' die. Rolling the three dice of a set and using always the highest score for evaluation will show a different winning pattern for the two sets of dice. With the first set of dice, die B will win with the highest probability (88/216) and dice A and C will each win with a probability of 64/216. With the second set of dice, die C' will win with the lowest probability (56/216) and dice A' and B' will each win with a probability of 80/216. Efron's dice are a set of four nontransitive dice invented by Bradley Efron. 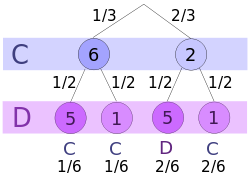 A conditional probability tree can be used to discern the probability with which C rolls higher than D.
B's value is constant; A beats it on 2/3 rolls because four of its six faces are higher. Similarly, B beats C with a 2/3 probability because only two of C's faces are higher. These variant dice are useful, e.g., to introduce students to different ways of comparing random variables (and how only comparing averages may overlook essential details). A set of four dice using all of the numbers 1 through 24 can be made to be nontransitive. With adjacent pairs, one die will win approximately 2 out of 3 times. For rolling high number, B beats A, C beats B, D beats C, A beats D.
These dice are basically the same as Efron's dice, as each number of a series of successive numbers on a single die can all be replaced by the lowest number of the series and afterwards renumbering them. Miwin's Dice were invented in 1975 by the physicist Michael Winkelmann. Like Miwin’s set, the probability of A winning versus B (or B vs. C, C vs. A) is 17/36. The probability of a draw, however, is 4/36, so that only 15 out of 36 rolls lose. So the overall winning expectation is higher. Warren Buffett is known to be a fan of nontransitive dice. In the book Fortune's Formula: The Untold Story of the Scientific Betting System that Beat the Casinos and Wall Street, a discussion between him and Edward Thorp is described. Buffett and Thorp discussed their shared interest in nontransitive dice. "These are a mathematical curiosity, a type of 'trick' dice that confound most people's ideas about probability." Buffett once attempted to win a game of dice with Bill Gates using nontransitive dice. "Buffett suggested that each of them choose one of the dice, then discard the other two. They would bet on who would roll the highest number most often. Buffett offered to let Gates pick his die first. This suggestion instantly aroused Gates's curiosity. He asked to examine the dice, after which he demanded that Buffett choose first." In 2010, Wall Street Journal magazine quoted Sharon Osberg, Buffett's bridge partner, saying that when she first visited his office 20 years earlier, he tricked her into playing a game with nontransitive dice that could not be won and "thought it was hilarious". A number of people have introduced variations of nontransitive dice where one can compete against more than one opponent. Whatever the two opponents choose, the third player will find one of the remaining dice that beats both opponents' dice. A beats C beats E beats B beats D beats A (second chain). There are two major issues with this set, however. The first one is that in a two-die option of the game, the first chain should stay exactly the same in order to make the game nontransitive. In practice, though, D actually beats C. The second problem is that the third player would have to be allowed to choose between a one-die option and a two-die option - which may be seen as unfair to other players. A four-player set has not yet been discovered, but it was proven that such a set would require at least 19 dice. Tetrahedrons can be used as dice with four possible results. How to see it? The following tables show all possible outcomes. In "A versus B" A wins in 9 out of 16 cases. In "B versus C" B wins in 9 out of 16 cases. In "C versus A" C wins in 9 out of 16 cases. In analogy to the nontransitive six-sided dice, there are also dodecahedra which serve as nontransitive twelve-sided dice. The points on each of the dice result in the sum of 114. There are no repetitive numbers on each of the dodecahedra. The miwin’s dodecahedra (set 1) win cyclically against each other in a ratio of 35:34. The miwin’s dodecahedra (set 2) win cyclically against each other in a ratio of 71:67. It is also possible to construct sets of nontransitive dodecahedra such that there are no repeated numbers and all numbers are primes. Miwin’s nontransitive prime-numbers-dodecahedra win cyclically against each other in a ratio of 35:34. Set 1: The numbers add up to 564. Set 2: The numbers add up to 468.